Trump would really hate it. In 1962, legendary graphic designer Raymond Loewy offered to give Air Force One a new look. Of the several sketches that Loewy proposed, President Kennedy chose one with red and gold coloring–and asked that it be rendered in blue, his and First Lady Jackie Kennedy’s favorite color. President Kennedy’s choice has been an American emblem since. That is, until President Trump took office–and decided the classic design wasn’t “American” enough. The San Francisco and New York-based design firm Collins has taken it upon itself to offer the president some new options. However, all of their designs are inspired by Loewy’s original one to preserve the designer’s legacy while giving Air Force One a modern update. The studio’s new ideas retain the elegant, aerodynamic lines of Loewy’s original, but with bolder colors. One is predominantly blue, with touches of red and white. Two others are similar-looking remixes with different combinations of the American colors. The fourth is the most fun: It looks like a rainbow–an exuberant celebration, perhaps, of the diversity that Trump derides? 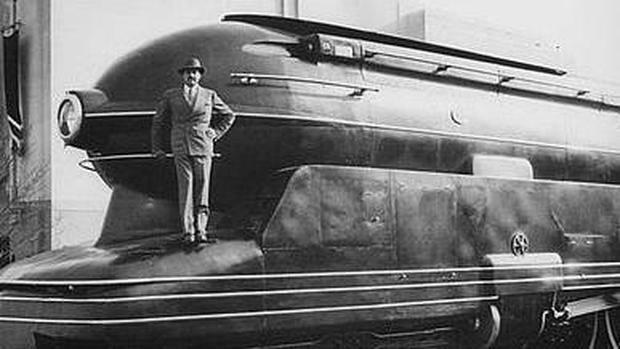 John Wall is the author of Streamliner, a biography of Raymond Loewy published by Johns Hopkins University Press. It will go on sale Aug. 15. News outlets just announced that the Trump administration is going to redesign Air Force One, the Boeing 747 with the iconic blue-on-blue-on-white paint job that has heralded the arrival of every American president since John F. Kennedy. As an internationally known industrial designer from 1930 to the 1970s, Loewy was well known as the designer of Air Force One’s distinctive color markings. His iconic ultramarine blue-on-blue design has lasted almost 60 years, commissioned by John F. Kennedy, Jacqueline Kennedy and Air Force General Godfrey McHugh. While many of Loewy’s designs did not last beyond his lifetime, the case for retaining most, if not all, of the current aircraft’s design is compelling. No single aircraft is more instantly recognizable than Air Force One. 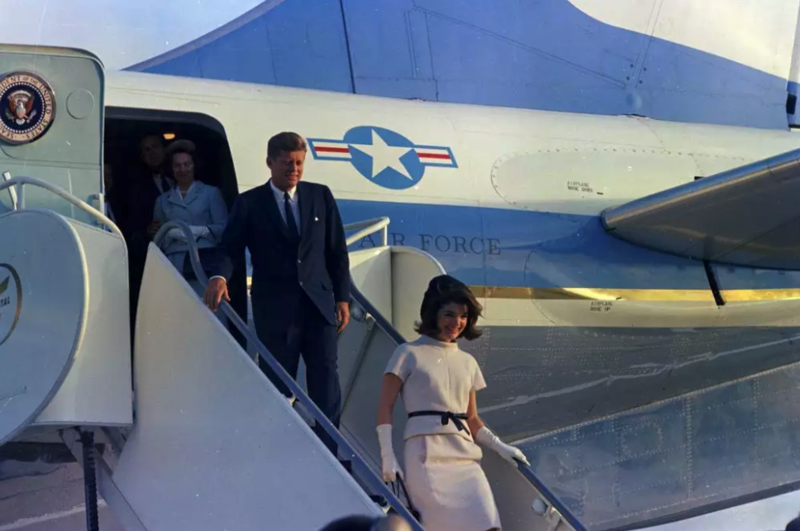 The president’s jet has been linked with memorable images, from Lyndon B. Johnson taking the oath of office on the plane after the Kennedy assassination, to any number of shots of presidents descending the stairs after a triumphal trip overseas or campaign stop. The aircraft is a place where policy is made, friendships are forged, and seminal events in history occur. Such a vehicle carries weight as a symbol, which means, and meant even more so in Loewy’s time, thatAir Force One carried the force of the United States in its appearance. The more accurate story emerges from Loewy’s own archives in the Hagley Museum and Library in Wilmington, Delaware. According to the 1967 notes in Loewy’s archive, the designer came to the White House with four graphic proposals and five lettering ideas. According to the notes, Loewy’s first ideas were predominantly red. Kennedy made the decision to make the color pattern blue. According to design historian Phil Patton, Secretary of Defense Robert McNamara had to personally authorize the color change. The famed designer’s final creation retained the white top section but substituted sweeping shades of blue, including the aquamarine that covered the lower nose section and the cowling on the engines. Previously, presidential planes had been identified by “United States Air Force” or “Military Air Transport Service” along the upper fuselage. Loewy substituted “United States of America” on the fuselage and placed a flag on the tail section. The flag’s union (the blue section) faced toward the nose. Loewy also reduced the intensity of the blue in the flag in order to match the blue used on the rest of the jet. The typeface for the fuselage lettering was supposedly inspired by the type used in the heading of the Declaration of Independence. As a result, “United States of America” was set in widely spaced Caslon typeface. Media reports say the current thinking on the redesign is to create what the President no doubt would call a “fantastic and tremendous” red, white and blue. This is a grand old color scheme, but also one that has been applied to everything from bikinis to motorcycle helmets to baseball hats. Let’s take a step back for a moment and consider. Do we really want the person who “personally oversees” every aspect of his brand–including Trump Success (a fragrance), Trump Steaks, Trump Casinos, Trump ties (extra long) and Trump wine – to come up with an aircraft design that can compete with the majesty, dignity and stateliness of the current look? I think not. And Raymond Loewy would agree with me. The current look of Air Force One is a true design classic. It dates back to 1962, and is the result of collaboration between JFK and Raymond Loewy, one of the fathers of industrial design. Regardless of Trump’s vision, it’s highly likely that the next presidential plane will look different as the current aircraft approach the end of their lifespan and emerging technology makes a replacement necessary. 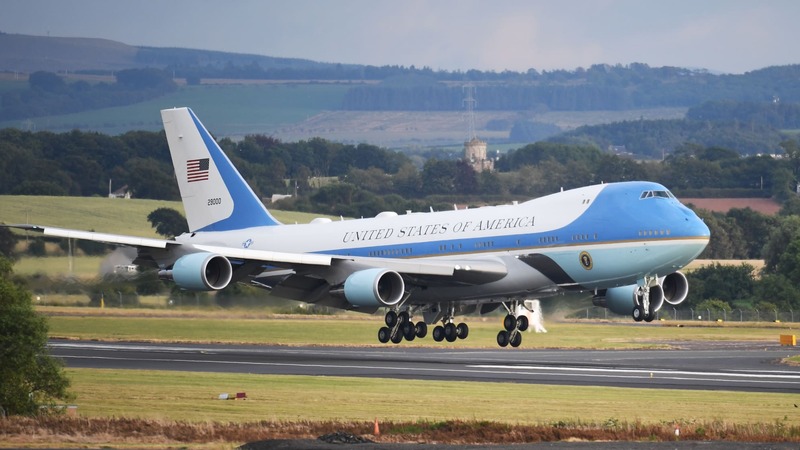 Air Force One is technically not the name of a plane, but rather the callsign used by air traffic controllers to refer to whatever aircraft is carrying the President. Popularly, though, it is the name given to the presidential plane, a modified Boeing model 747-200B, which under Air Force designation is known as a VC-25A. There are two of them, so that at least one is ready at all times. They’re mostly identical except for their tail codes: SAM 28000 and SAM 29000 (SAM stands for Special Air Mission). The callsign was adopted in 1953, after the plane carrying President Eisenhower and a commercial airliner, both with the tail code 8610, dangerously entered the same airspace. The president’s aircraft at that time was a prop plane — a Lockheed C-121 Constellations nicknamed Columbine II — but it was again Eisenhower who flew on the first presidential jet, a modified Boeing 707 that entered service in 1959. At that time, the planes were still full-fledged military aircraft and they sported a red, orange and black color scheme designed by the Air Force. The radical redesign that still survives today debuted on a brand new Boeing 707 (or C-137 Stratoliner as the Air Force called it) with tail code SAM 26000. It entered service in October of 1962. “It evolved from an interesting interaction between JFK, Jackie Kennedy and Raymond Loewy, who was a famed industrial designer,” said Air Force One historian and former Smithsonian curator Von Hardesty in a phone interview. Although one of Loewy’s initial sketches included some red, the final design did not. The dominant blue paint job came at JFK’s request. “The seafoam blue and silver on the lower half was a stroke of genius to make the plane seem more horizontal and sleek,” said designer and former president of the American Institute of Graphic Arts Sean Adams in an email interview. “The seafoam is a surprising choice, but an elegant solution to the issue of making the plane sophisticated and modern, stepping away from the military look of Eisenhower’s Air Force One. The plane spoke to an optimism, youth, and fresh approach that was perfect for the Kennedy administration,” he added. The typeface for the legend “United States of America” is Caslon, very similar to the one used in the Declaration of Independence. The plane remained in service until the Clinton administration, but it was replaced as the main presidential aircraft by another 707 in 1972. That particular airplane, tail code SAM 27000, was retired in 2001 after having served seven presidents: Richard Nixon, Gerald Ford, Jimmy Carter, Ronald Reagan, George H. W. Bush, Bill Clinton, and George W. Bush. During the Reagan administration work began on a new generation of Air Force Ones, with first lady Nancy curating the interior design. But due to a number of delays, the planes only entered service under George H. W. Bush in 1990. While almost every system was upgraded, the paint job was preserved. “A good design brings with it a certain inertia and you really need to have a compelling reason to change it. By that point, it was so widely accepted and universally applauded that they just wanted the new 747 aircraft to have it too,” said Harvesty. These are the planes that are still in use today, and the Loewy design has undergone only minor amendments, due to the larger size of the 747s. “It’s faithful to the Raymond Loewy design as much as possible on a behemoth of a plane. It’s hard to make a 747 look light and sophisticated, but the color, shapes, and typography do a great job. It maintains all the positives from the 1962 version. I’m especially glad that the 1980s didn’t creep in on the design with mauve and almond,” said Adams. Earlier this month, Boeing confirmed it received a $3.9 billion contract for two new presidential planes. They will still be 747s — albeit a newer version, the 747-8 — even though the aging plane is being phased out by commercial airlines. “The reason is that the Secret Service requires, in the interest of safety, that the President should fly only on four-engine aircraft. The 747 also provides more space for the President, his key staff, and the complex communications equipment required for the president to be in touch with anyone in the world at all times,” said aviation expert Gene Heisman in an email interview. How exactly this will play out is still unclear. It’s unlikely but Trump could even decide to repaint the current planes instead of waiting for the new ones, which will only enter service by 2024 (though the President has requested that the planes be ready sooner in 2021). According to Von Hardesty, there are no fixed rules regarding the implementation of Air Force One’s design, so anything can happen. “I love the current design. But perhaps the President’s motivation is that the aircraft should reflect more explicitly a sense of American patriotism, and red, white and blue, of course, are synonyms of that. If the president wants to review and possibly change the livery, there is no historical precedent that stands in the way of him doing so,” he said. Donald Trump made the already ongoing procurement of new Air Force One aircraft a token defense spending issue even before taking office. Since then, the first year and a half of his presidency has been chock full of news regarding what is a relatively tiny but critical acquisition program within the Pentagon’s massive portfolio. Outright false claims of huge savings on the new aircraft, the controversial move to buy orphaned airframes once destined for Russia, and the airplane’s apparent lack of critical capabilities are just some of the issues that have reared their ugly head regarding the White House’s direct involvement in the program. Now the President wants to do what seems to be unthinkable, to change the iconic blue, white, gold, and seafoam (“Luminous Ultramarine”) paint scheme that has adorned the flying White House since JFK sat in the Oval Office over half a century ago. In fact, Jackie Kennedy was a pivotal player in the creation of Air Force One’s now iconic livery, transforming the design from the less than elegant flight-test orange motif to the one know so well today. Air Force One looks the way it does because President John F. Kennedy sat on the floor of the Oval Office with an industrial designer, scissors, paper and crayons. It was May 1962, and the Air Force had ordered a Boeing C-137 Stratoliner for the president… The Air Force had designed a red-and-gold color scheme for the plane, a modified long-range Boeing 707. Raymond Loewy, the world’s preeminent industrial designer, viewed the Air Force One design as hideous. Loewy owned the largest design firm in New York. He had designed Lucky Strike cigarettes, Studebaker cars, Coca-Cola bottle, Electrolux refrigerators. The press called him The Man Who Streamlined America. First Lady Jacqueline Kennedy, with her unerring sense of style, lobbied the president to hire the French-born Loewy. Loewy met with the president twice. 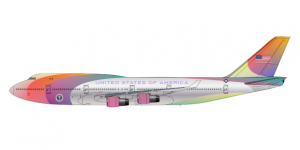 The first time, he and Kennedy sat on the floor of the Oval Office drawing with crayons and cutting up paper to come up with a livery for Air Force One. Then Loewy visited the National Archives to examine historic documents. He was struck by the first printed copy of the Declaration of Independence, it had the country’s name set widely spaced in capital letters in a typeface known as Caslon. Kennedy had already ordered the Air Force to remove the military lettering in favor of the simple United States of America. And he told Loewy he liked blue. Loewy chose two blues: slate and cyan. He left the underside of the fuselage silver and added the presidential seal near the nose, a large American flag to the tail, and the words “United States of America” in capital letters using the Caslon typeface. The First Lady had a hand in designing the interior of the plane. Kennedy had his own entrance, a pale blue rug with an American eagle in the center of an oval with 13 stars, a customized bed, a stateroom, a conference room and glassware from Tiffany’s. Air Force One to this day carries the Loewy design. So this is not just screwing with some airplane’s paint job, it is destroying a historic work of art by a legendary designer and one of America’s most beloved White House couples. 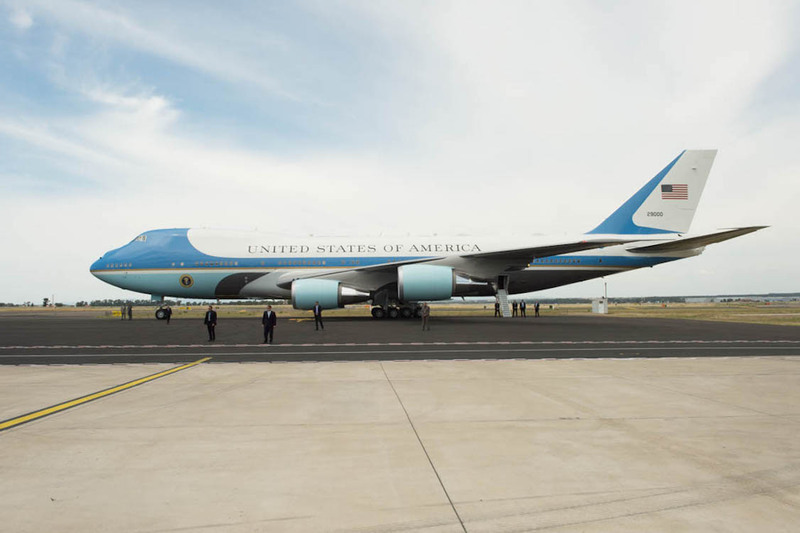 The paint scheme is part of our collective heritage and a major reason why Air Force One remains one of the most recognizable symbols of American ingenuity, might, and prestige to this very day. Trump wants to change the plane’s signature blue-and-white look that goes back 55 years, to a redesign of the presidential aircraft by President John F. Kennedy and First Lady Jackie Kennedy in the early 1960s. We’re told that Trump wants a color scheme that “looks more American” and isn’t a “Jackie Kennedy color.” He doesn’t think the current blue (technically “luminous ultramarine”) represents the USA. We’re told he wants the presidential bed aboard Air Force One to be larger and more comfortable — more like the executive livery package on his personal plane than the current, couch-like sleeping configuration aboard Air Force One. So POTUS seems to want Air Force One’s appearance to be a ‘louder’ visual affair, something akin to a flying flag. Donald Trump has a long history with aircraft of his own, which are famously known for wearing red, black, white, and gold schemes with a huge italicized TRUMP on their fuselages. Even his lower-profile Citation X had huge Rolls-Royce logos and his made-up family crest painted by its cabin door. Trump’s 757, which once belonged to Paul Allen and replaced his ultra-gaudy 727, was also used as a constant backdrop during his campaign. So although this development is troubling, it isn’t very surprising. What the President wants to do with his personal property is fine. I actually get a kick out of the crazy branding on his airplanes and helicopters and his in-your-face branding style has made him a wealthy and famous man. There is no doubt that he definitely has an amazing knack for self-promotion. But this isn’t his plane. It belongs to all of us. And turning it into a silly 4th of July fireworks stand billboard can’t happen. It wouldn’t make us look powerful. It would make us look ridiculous. Many people have joked that Trump will paint a giant eagle on the nose of Air Force One. When it comes to Presidential aircraft, there is actually a precedent for that. A VC-118 Liftmaster nicknamed Independence had just this motif when it flew President Truman around. This was before the cultural lore of Air Force One was established though. Maybe the most conservative thing we can hope for is something akin to the old American Airlines 747 scheme that was also flown on the Shuttle Carrier Aircraft for years. But it will probably involve a lot more flash based on what we have seen on Trump’s own aircraft in the past. It’s fine that the President wants to put his touch on the new jets. Including some unique interior elements and other small details like adding a big bed and some gold-plated fixtures or something really shouldn’t be a problem. But changing the aircraft’s outward appearance is. Clearly, the USAF brass will have some very strong opinions of their own about fooling with Air Force One’s historic and elegant look. But the question then becomes would they actually be willing to take on the White House over such an issue? Probably not, especially considering how this President holds brutal grudges. The good news is we still have at least a few years before the first of two 747-8i replacements for the USAF two aging VC-25As enters service, so enjoy their gorgeous paint scheme why you still can. And please, nobody tell POTUS that a new Marine One will be arriving even sooner. Air Force One, which next to the White House is the ultimate symbol of American Presidential power and prestige, is being replaced by two new Boeing aircraft of a cost of just under $4 billion. In the process, the plane’s exterior may be getting a facelift that could erase a design that was gifted to United States by an iconic designer who also had a major impact on American business including the auto industry. Raymond Loewy, the French-born industrial designer who designed everything from locomotives to delivery vans, and automobiles to Coca-Cola vending machines, as well as the logos for Shell, Exxon and TWA, offered his services to President John F. Kennedy in 1962, according to Presidential historian Michael Bechloss. The automobile designs from Loewy’s independent studio, starting with Hupmobile in the early 1930s. After World War II, Loewy and his chief automotive designer Virgil Exner, made Studebaker a contender with designs for cars such as the Studebaker Starlight, Starliner, Hawk and Avanti. The company’s vehicles are widely considered some of the most striking and original designs of the post-World War II automotive design era even though Studebaker itself didn’t have the heft to compete with General Motors, Ford Motor Co. and Chrysler. “When the first jet, a Boeing 707, was added to the presidential fleet in 1959, Dwight D. Eisenhower was content to let the plane’s nose and tail be painted with the Air Force’s easily visible “international orange” and the sides with the block-lettered label of an obscure bureaucracy: Military Air Transport Service,” Bechloss said in an article in the New York Times that was printed in 2015. “In March 1962, Mr. Loewy, who had a house in Palm Springs, Calif., saw the presidential plane landing at the airport there. That evening, he told his friend Gen. Godfrey McHugh, Kennedy’s Air Force aide, that the aircraft, with its ‘rather gaudy’ orange graphics, looked ‘terrible.’ General McHugh explained that an enlisted man of little experience was responsible for the design. “He added that a new Air Force One was being constructed. Mr. Loewy offered to make some suggestions, without taking a fee, on how the new plane’s appearance could be made more distinguished,” Bechloss wrote. Kennedy accepted the offer Loewy’s offer and the result was the striking design, with its vibrant United States of America signage along the side that has been used by American Presidents, Democrat and Republican, to great effect ever since the 1960s. 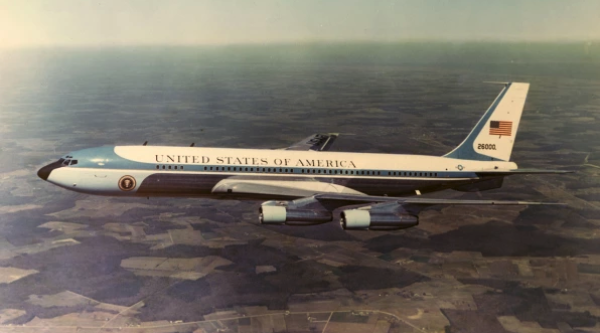 Air Force One itself has gone through several iterations but the exterior design has remained true to the concept Loewy gifted to the United States back in 1962. However, President Donald Trump has proposed junking the elegant and majestic design in favor of something different as the next iteration of Air Force One is scheduled for delivery in 2024. 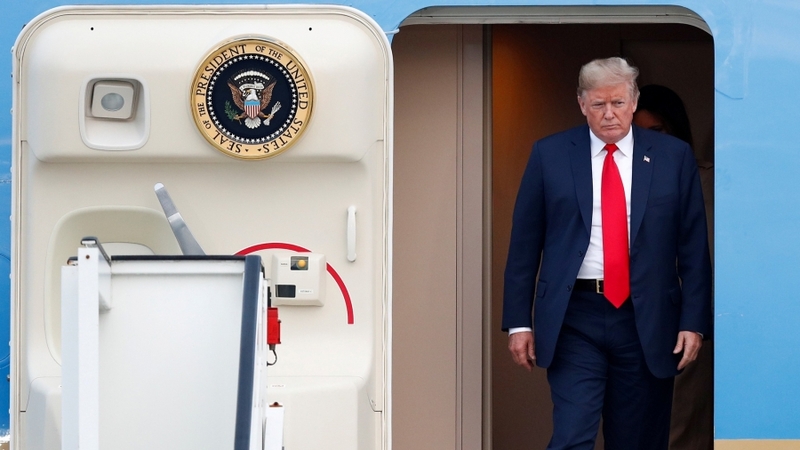 President Trump confirmed that he wants to redo Air Force One during his term in office, in an interview with CBS that aired last week, he told reporter Jeff Glor that he planned to repaint the iconic aircraft red, white and blue. “Air Force One is going to be incredible,” Trump told Glor. WASHINGTON (AP) — President Donald Trump says Air Force One is getting a patriotic makeover. Trump says the familiar baby blue color on the presidential aircraft will give way to a red, white and blue color scheme. Updated models could be in service before the end of a potential Trump second term. White House press secretary Sarah Huckabee Sanders said Wednesday that the Air Force awarded Chicago-based Boeing Co. a $3.9 billion contract for two presidential planes that will be ready in 2024. They will replace a pair of Boeing 747 jumbo jets that are now 31 years old. The contract confirms a deal reached in February by Trump, the Air Force and Boeing. Sanders said the final price represented a savings of $1.4 billion from an initial contract proposal. The presidential plane — it goes by the radio call sign of Air Force One when the president is on board — was once a Boeing 707 that had orange above and below the nose and “United States of America” painted on the sides in blocky, all-caps lettering. According to Boeing history, first lady Jacqueline Kennedy picked new colors for the plane used by her husband, President John F. Kennedy. A swath of baby blue covers the nose and sweeps back along each side of the fuselage. The lettering was changed to a font inspired by the heading of the Declaration of Independence. The livery was the work of French-born industrial designer Raymond Loewy, whose previous clients included Lucky Strike cigarettes and Studebaker cars. 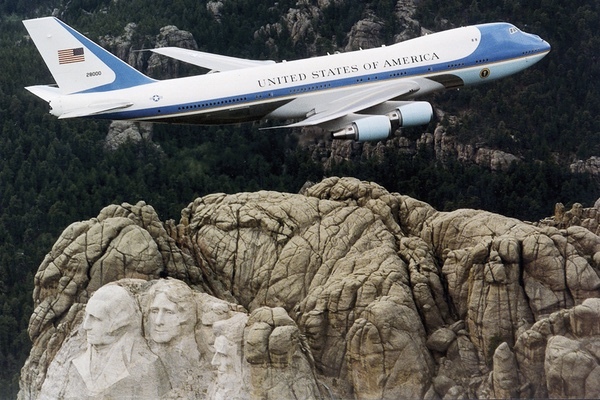 The Museum of Modern Art in New York describes his Air Force One design as modern and elegant. The plane is immediately recognized around the world. Trump said he began thinking about a redesign after reaching a deal for new planes. Loewy wrote that President Kennedy picked the blue paint scheme over a red one. Some accounts said Kennedy rejected the Air Force’s red and gold theme because it looked too imperial. The awarding of the final contract comes after more than a year of back-and-forth between Trump and Boeing over the cost of new planes. Boeing chief executive Dennis Muilenburg and Trump met several times to discuss the Air Force One contract. Boeing boasted that it was proud to build the new presidential planes, and it promised to give taxpayers a good deal. Boeing said work including design, modifications and testing of two 747-8 planes will be done in San Antonio and is expected to be finished by December 2024. Through interviews with Loewy designers and contemporaries, family films, to tours of his mid century modern Palms Springs home and his historic French chateau, one gets some perspective how Loewy’s life style influenced his art. Through his principle of MAYA, Most Advanced Yet Acceptable, he designed everything from streamlined locomotives to steamships, household appliances to classic automobiles, interiors for NASA and the Concorde, along with his iconic Air Force One. Loewy’s son-in-law David Hagerman discusses how he touched us all in one way or another and laments how most are not familiar with Loewy or his body of work today. Credits: Frederique Bompuis and Jerome de Missolz, ARTE France, Silk Drum Films, Iliom, and Avrotos, with the participation of TV5 Monde 2017. Roanoke, Va., — On Sept. 23, 2006 the first gallery devoted to “the father of industrial design” opened in a railway station that Raymond Loewy himself designed almost 60 years ago. The former N&W Railway passenger station, which now houses The O. Winston Link Museum, was redesigned in 1949 when N&W (now Norfolk Southern) commissioned Loewy, known the world over for his product and logo designs, to create a look that reflected the company’s modern, progressive image. Loewy’s designs have become cultural icons and include Air Force One, the slenderized Coca Cola bottle and fountain dispenser, the Studebaker Avanti, interiors for NASA’s Apollo and Skylab series, interiors for the Concorde, Greyhound’s Scenicruiser, the US Postal Service seal, logos for Shell, BP, Exxon, and Lucky Strike. Keenly interested in transportation design, Loewy was a pioneer in advocating fuel-efficient cars and lower-maintenance locomotives. His first railroad industry design was the aerodynamic GG-1, the first welded locomotive ever built. It was the first of many designs he would complete for the Pennsylvania Railroad and for the N&W Railway. The N&W Railway’s passenger station was one of Loewy’s first public building projects. A classically proportioned example of Art Modern architectural style, the station’s renovated interior retains the Loewy-designed sleek lines, brushed aluminum surfaces and terrazzo floors. Many of O. Winston Link’s critically acclaimed photographs of the final days of steam locomotion were shot in and around the Loewy-designed passenger station which now will be devoted to the genius of both men. 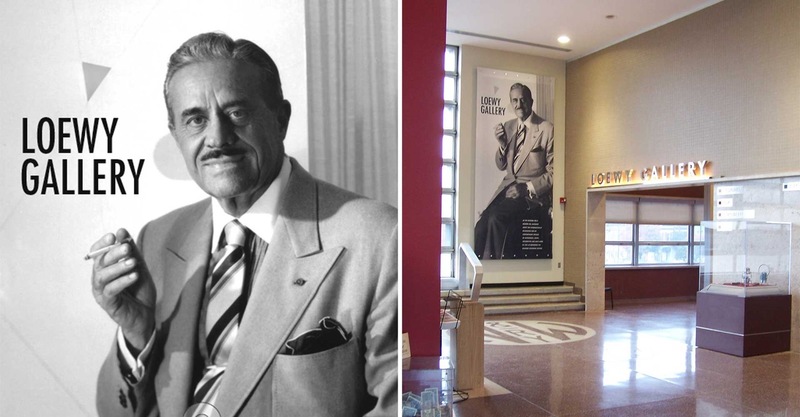 The O. Winston Link Museum’s Raymond Loewy Gallery emphasizes Loewy’s transportation design and remains the only permanent gallery devoted to his work. Artifacts for the gallery have been collected from numerous sources including The Loewy Estate, the U. S. Postal Service, and the Hagley Museum & Library in Wilmington, Del. David Hagerman, Laurence Loewy’s husband addressed museum patrons and premiered her new documentary film RAYMOND LOEWY LOVED LOCOMOTIVES, along with filmmaker Ross Stansfield. The 1717 Design Group, the Richmond, Va. based firm is the Raymond Loewy Gallery’s designer. The O. Winston Link Museum, at 101 Shenandoah Ave., is open Monday through Saturday from 10 a.m. to 5 p.m. and Sunday noon to 5 p.m. The Raymond Loewy Gallery is open to the public at no charge. By then, Loewy had designed the 1962 incarnation of Air Force One, inside and out. And he designed NASA’s Skylab, just for good measure. He transformed many a logo as well: the Post Office into the Postal Service … Esso into Exxon. 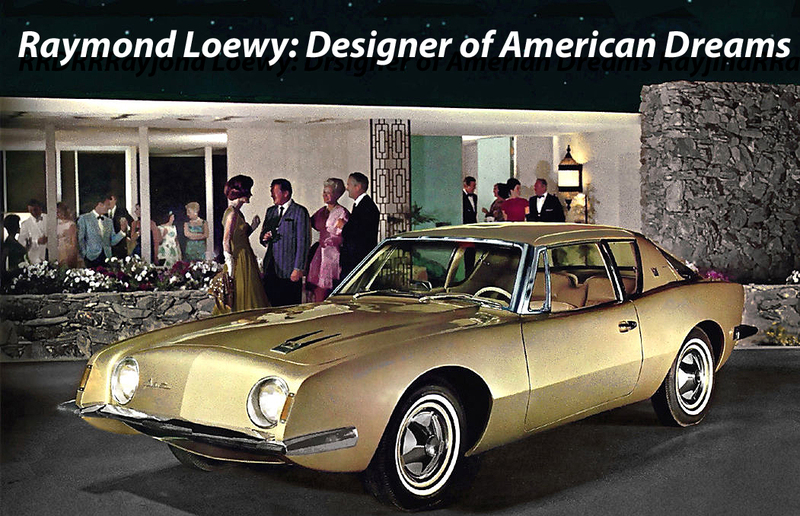 But Raymond Loewy is perhaps best remembered for the car which he designed for Studebaker in the 1960s: the Avanti. To this day, it’s one of the models most prized by collectors of classic cars. 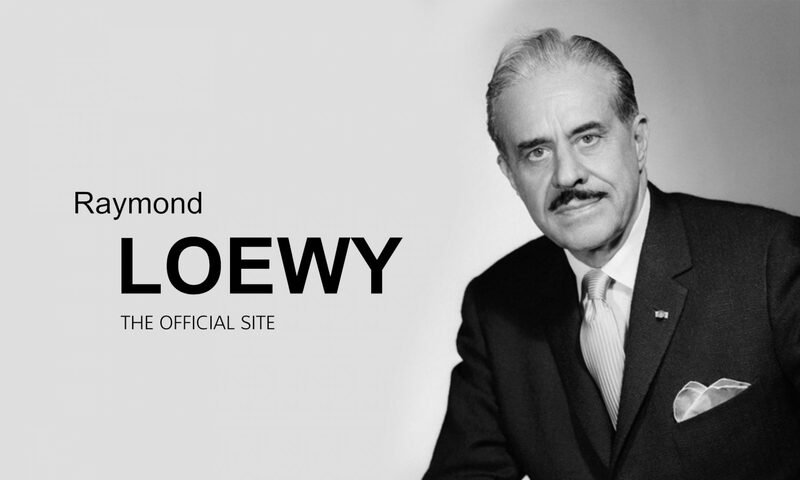 The Raymond Loewy Foundation was established with the specific objectives of preserving Raymond Loewy’s image and heritage and promoting the discipline of design internationally. Each year it awards the Lucky Strike Designer Award and the Lucky Strike Junior Designer Award. Past recipients include Donna Karan, Karl Lagerfeld and Michael Ballhaus. Read more by visiting the web site www.RaymondLoewyFoundation.com.